"Many parents believe empathy is one of those soft skills, like courage or humility, that are important to healthy development. However, empathy reigns supreme among social-emotional skills and plays a surprising role in predicting kids’ life-long success. When children develop empathy, research shows they thrive in school and life. They also learn to impact their communities in positive, often extraordinary ways. As parents, we must ask, “Have we misled children to believe success is achieved through test scores, material wealth, and personal gain alone?” What other ways should we define success? The Digital Age has given our children more ways to connect with others than ever before, but many researchers are concerned with how social networking and fewer face-to-face relationships may have contributed toward a 48% drop in empathetic concern for others over the past few decades. Studies also link low empathy to increased bullying, narcissism, rigid belief systems, and civic apathy. "It was the perfect summer. That is, until Jeremy Ross moved into the house down the street and became neighborhood enemy number one. 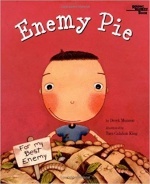 Luckily Dad had a surefire way to get rid of enemies: Enemy Pie. But part of the secret recipe is spending an entire day playing with the enemy! "Family values are reflections of who we are and how we parent. When parents lead with empathy, gratitude, and kindness, children learn to do the same". Here are some fun games to explore the world of empathy with your kids, which could be played at school or in the convenience of your own home as a family. If there's a personal story you'd like to share from your family's experience, do share your reflections with us.